Ajaya added further lustre to a fine week at York for trainer William Haggas with an authoritative success in the Irish Thoroughbred Marketing Gimcrack Stakes. Ridden by Graham Gibbons, the Invincible Spirit colt, who won on the Knavesmire in July and was second to Gutaifan in the Prix Morny on his previous outing, travelled comfortably as American raider Finnegan cut out the pace. As the latter began to tire, Ajaya (7-2) picked up smartly for Gibbons from the two-furlong pole and quickly put the race to bed when asked, holding the finish of Ribchester by a length and a quarter. There was further joy for Haggas with stablemate Raucous running a race full of promise in third. Gibbons said: "Coming down to the two I thought it would take a good one to beat me. He showed some turn of foot and even though he is small he has a big action. He galloped right to the line." 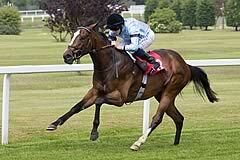 Haggas said: "Ajaya has done nothing but improve physically. "The rain scuppered his chance in France. It started raining two hours before and it was game over. "I think we'll go for the Middle Park Stakes now and take it from there." He added: "Raucous is developing really well. He was a bit too raw for this race and he'll be a good horse, I hope. "We're very fortunate with our two-year-olds this year. We never have a lot, but I'm sure they are helping each other along."